It’s that time of month where we go through the news.. been a reasonably quiet one. QATAR have rolled out their new 787’s and flydubai are going to operate cheap flights to the Maldives! Categories: Information | Tags: 787, blog, boeing, dubai, Information, maldives, qatar | Permalink. Categories: Information | Tags: air arabia, airline, airlines, al arabi, dubai, emirates, etihad, gulf air, news, october, qatar, qatar airways, travel | Permalink. 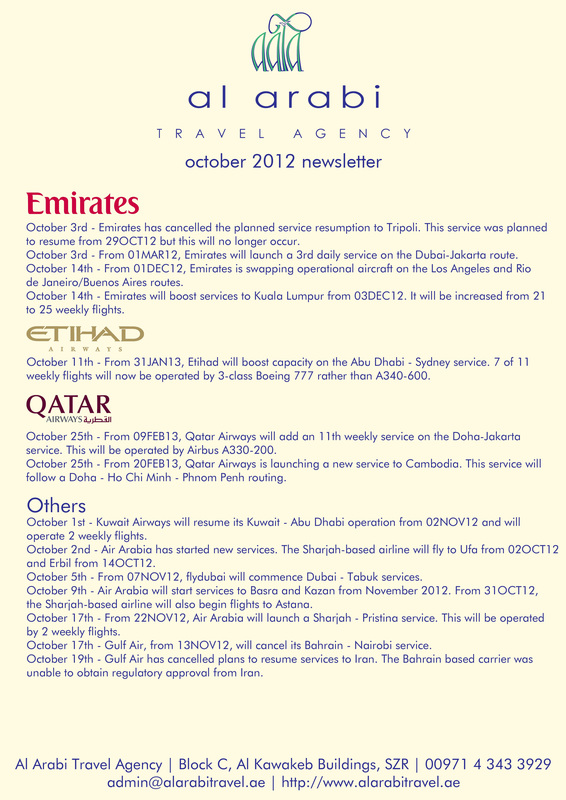 Categories: Information | Tags: airlines, al arabi, emirates, etihad, Information, news, qatar, september | Permalink. We normally use our blog for information providing but this offer had to be shared on every web portal we have. Fancy going to the USA this summer? We have some extra special rates with Qatar Airways – NYC starting from AED2,200 (excluding taxes and fuel surcharges)!! Categories: Offers | Tags: cheap, dubai, flights, holidays, qatar, summer, uae, usa | Permalink.